Jean’s Writing, http://jeanswriting.com is a wonderful blog site to visit. Jean writes, “You’re never too old, or too young to learn and it’s never too late to mark writer off a bucket list.” Her blog reaches out to the Blogosphere community of worldwide writers. She offers to work with writers, give much-needed encouragement in writing, and help with practice and submission of their work. She also has recommendations and reviews for good books to read. Any one on the list reading this can accept this award, follow the rules or not, and be happy with it. All of you amazing bloggers have made an effort to read, comment and interact with other bloggers, re-blogging posts, using social media, and sharing interesting post. That’s what the Dragon’s Loyalty Award is all about. This majestic, scary monster has a loyalty meaning! It’s a stretch, but think of it as a writer’s friend. Close your eyes and the two of you fly around in the sky, soar though the clouds, dive-bomb over strange lands and into other dimensions. Feel that dragon power! Let your imagination free fall, and write that perfect whatever you want, anytime you want. I’ll display the award photo on my website. I’ll write a post about it and link my nominee Jean to it. I’ll drop Jean a comment that I’ve linked her in the post. I’ve nominated all my favorite bloggers (you know who you are) on Before Sundown’s Awards Page. I’ll post one interesting thing about me. One interesting thing about me – a name change! It’s not a whim to use the name Chryssa again after so many years. Chryssa is Christine (my given name) in Greek. A name I adopted when I lived in Greece (1975-1980) and wrote poetry. Chryssa simply came back to edit a screenplay, pretty similar to writing poetry. The name change made sense to dominant, analytical thinking left-brain. Chryssa was pretty good at writing poetry, capturing core thought. She took emotional brainstorming blah, blah down to the right words and metaphor, with a zinger beginning and a knockout end. It’s much like screenwriting, with its compelling characters, tight dialogue and well-crafted scene changes. With that good track record, it made perfect sense to put old poetry & new screenwriting Chryssa know how into lagging behind book writing. So far, Christine’s been hung up on in-depth study of How To Write Better Books. There you have it, Chryssa’s come back to take charge, organize and inspire Christine to achieve her best, pushing ahead in writing whatever she wants in those WIP chapters sorted or set aside. Sounds a little like a dragon ride to me! 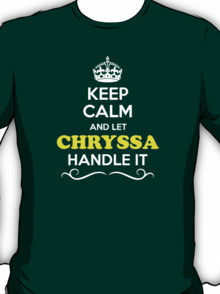 It’s on the Internet that people with the name Chryssa tend to be creative and excellent at expressing themselves. They know instinctively if something is a good idea or not and somehow always seem to be more than one step ahead of everyone else. 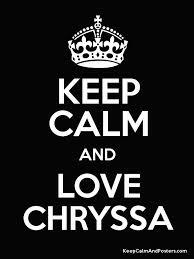 Hmm…I think Chryssa’s a keeper! You’ve got to love the tee shirt! Bouquets of Flowers for Anyone! 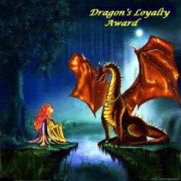 This entry was posted in Awards, My Blog, My Entries and tagged Chryssa's a keeper, Connect with fellow bloggers, Dragon power, Dragon ride in the sky, Dragon's Loyalty Award, Imagination free-fall, Name change, Write that perfect whatever, Writers friend. Bookmark the permalink. Way to go Christine. Have a wonder-filled week. Hugs! Thanks so much,Teagan! It’s starting out quite well. Happy Monday & Huge Hugs back! Chryssa is such a melodious name and fits the delight that Greece and its nationals inspire in me. I love the thought of a companions like the dragon to carry us through our toughest writing battles. You continue to SHINE at accepting these awards. I love it when you scroll though my day. Thanks, Christine. 😊 too much on my blogging plate right now, but I take that as a sign that another blogger or two need some dragon love more than I (for now!) he’ll find a good shoulder to perch, no doubt! It’s a wonderful award and has gone to someone very worthy here. Enjoy it. Jodi, thanks! Chryssa’s staying! Seems I’m having a lot more fun with her than I am with Christine. That one’ll probably never take a dragon ride! Always very much in favour of a new name and you picked a dandy! Love it. Congrats on the award! Thanks, Chryssa. Perhaps I’ll concentrate on sunsets for a while and see what I get! I see the resurrection in Chryssa! Very creative and memorable. Thanks so much! Yep, Chryssa’s come back to stay! Yay! Van, thank you! I’m thinking color can inspire! I’m not throwing Christine out! She’s got good sense to work with Chryssa! Maybe I should just call myself double C or CC!